Got here just in time on 20 October 2015 for the official opening of Cassia Phuket, Banyan Tree’s latest brand of hotel accommodations. 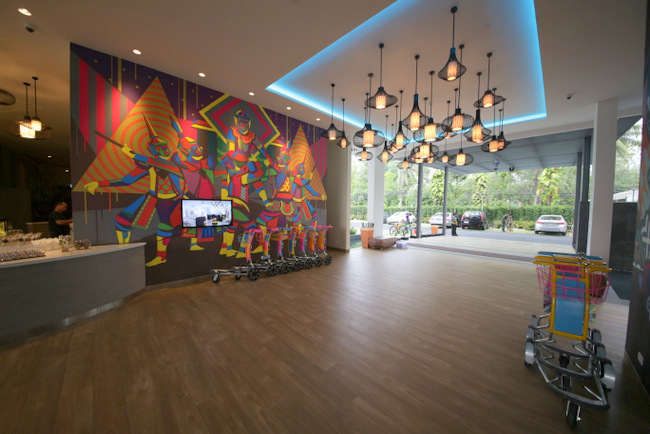 Cassia Hotels has finally opened its first hotel targeting millennials in Phuket with 221 rooms to house guests on 21 October 2015. 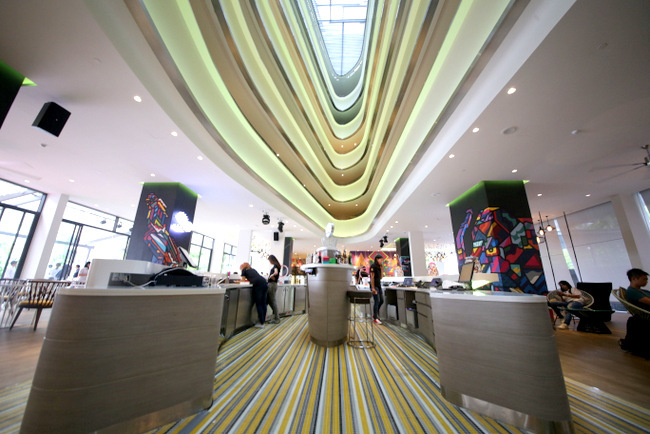 The interior is brightly designed with brightly coloured graffiti art throughout the hotel’s public areas and rooms. 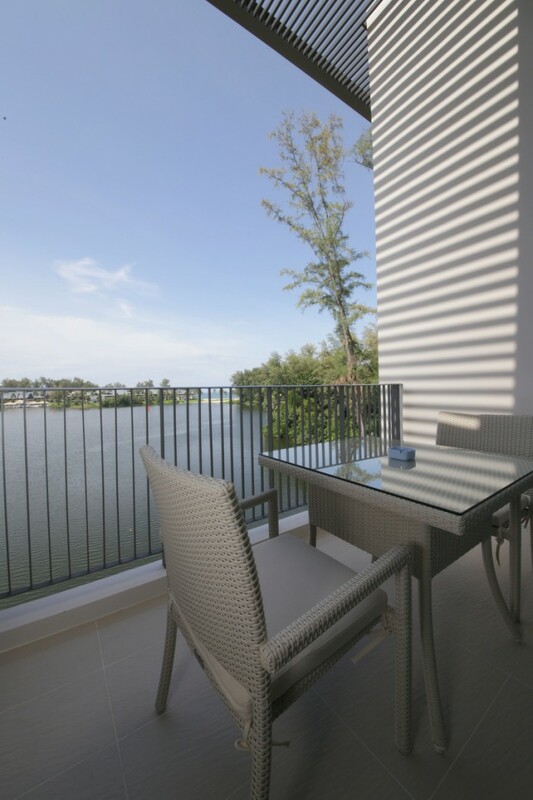 Cassia Phuket has a variety of one bedroom and two bedroom categories. The rooms are either water facing, loft or both loft and water facing. The one bedroom apartments range from 40 to 52 sqm while the two bedroom apartments range from 62 to 86 sqm. 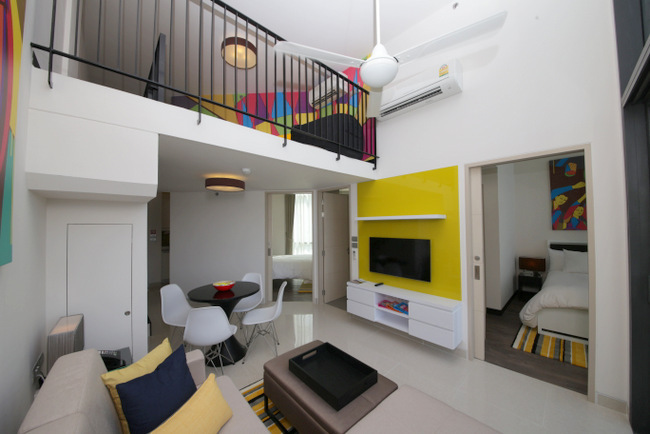 Cassia Phuket – Brightly coloured scheme. Photo taken on level four. This is also Laguna Phuket’s seventh hotel in the resort enclave which also houses Banyan Tree Phuket, Angsana Laguna Phuket, Dusit Thani Laguna Phuket, Outrigger Laguna Phuket Beach Resort, Best Western Allamanda Laguna Phuket and Laguna Holiday Club Phuket Resort. Arrive at Cassia Phuket and help yourself to a trolley to load your baggage. Cassia Phuket offers hip and fuss-free long or short term stays. Think of it as a self service hotel. Check in at the hotel and bring your bags up on your own to your room. There is no butler service. But what’s cool is the 24 hour free Wi-Fi. The friendly staff at the check in counters at the Meeting Point are also known as Cassia Friends. Dressed in casual tee shirts, you can ask these Friends any thing including where to visit during your stay. Laundry service is charged by weight instead of piece at Cassia Phuket. 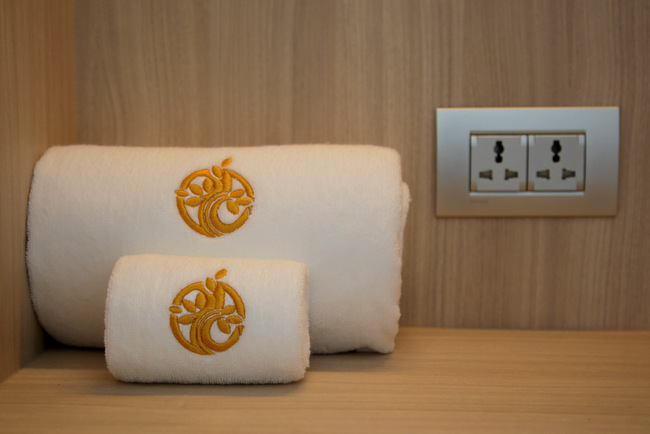 Housekeeping is provided once every two days during your stay. A laundry basket is provided in all rooms so you can bring your dirty laundry to get it washed at the Laguna Laundry in Canal Village. You are charged by weight instead of the piece norm. Every 100 gm of laundry costs THB38. Pick up your competitively priced food and refreshments from Market23. There is no restaurant service in the property. 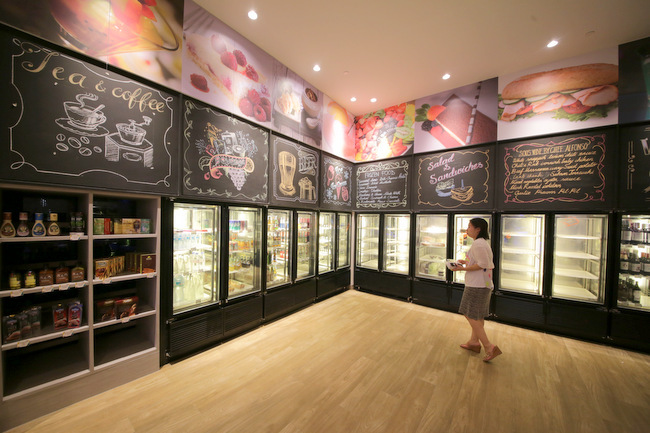 Instead meals and refreshments are available at Market23 Cafe & Bar, a 24 hour mart where you can pick up cold sandwiches and salads from THB180, pre packed ingredients for hot pot priced at THB250, THB320 or THB500 as well as beer, spirits and soft drinks amongst others. You can also enjoy a cup of freshly brewed gourmet coffee here. 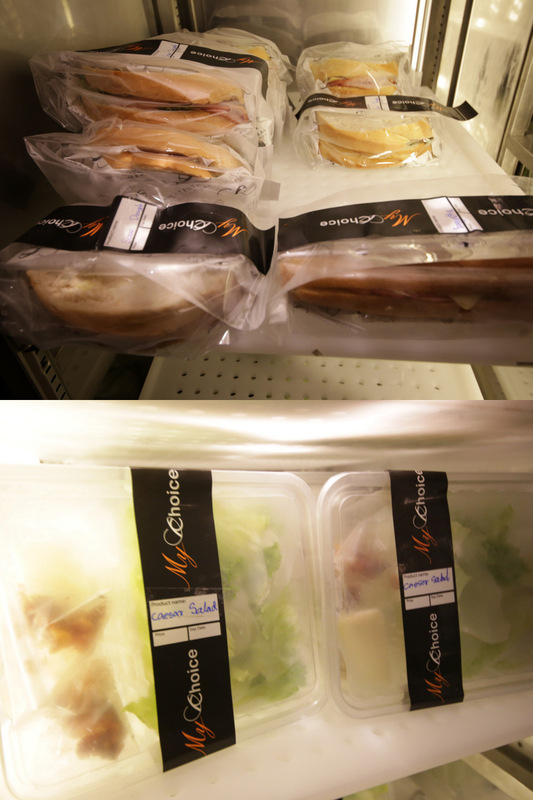 Sandwiches and Salads from Market 23 Cafe & Bar. I did enjoy the sushi platter and ham and cheese baguette. I don’t have a very big appetite, so the sandwiches here are huge enough to be split into two meals. 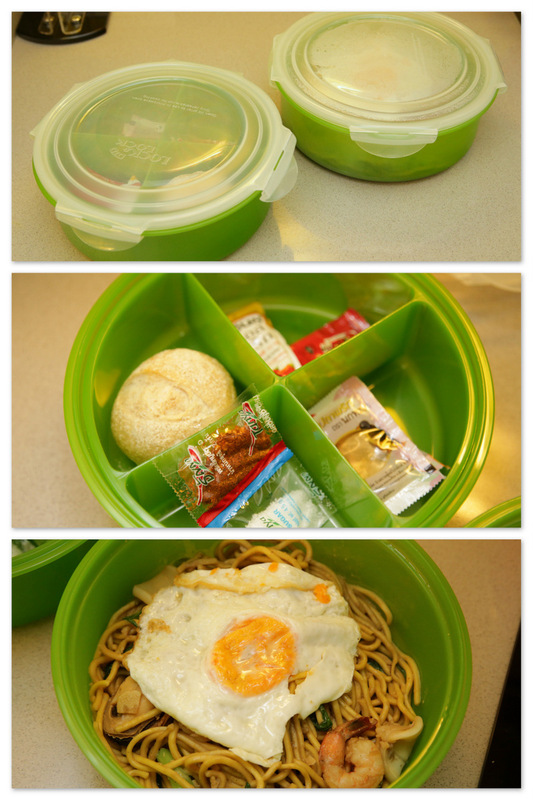 Breakfast is brought to your apartment every day. Cassia Phuket differentiates itself from other hotels with its tiffin breakfast. Packed into microwave-safe containers and delivered in this yellow heat proof bag, the tiffin breakfast set is placed in a compartment accessible from outside your apartment. Yes, deliveries and collection is done without anyone entering your room. Instructions on heating up your food are pasted in the kitchen so it is really idiot proof. Recipes are also provided in case you decide to cook up a meal. Housed in Apartment 411, a two bedroom water view and loft apartment on the fourth floor for two nights, the high ceiling loft apartment gives a very spacious feeling. The owners of the Cassia Phuket has cleverly made use of the space to create comfortable accommodation. I understand the opening price at my apartment is priced at USD100, 50% off the rack rates. Prices for this room type can go up to around USD300 during the new year. As part of the grand opening, you can enjoy two nights for the price of one from now till 19 December 2015 and 10 to 31 January 2016 if you book by 30 November 2015. The package comes with two continental tiffin breakfasts per room. The Loft is a great place to just relax or get some work done. I absolutely love the loft. You still get a great view of the lagoon from here because of the floor to ceiling glass doors. During my two day stay, this was where I got most of my work done. There is an air-conditioning unit at the loft and another in the living room so that the entire apartment gets cooled down pretty quickly. There are individual units in each bedroom as well. The fans in the bedroom and living room is another option if you don’t like air conditioning. 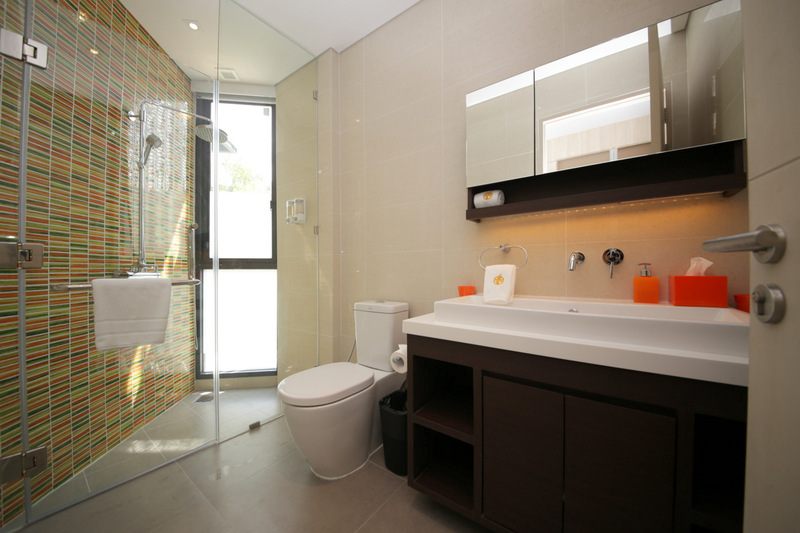 Inside the bathrooms, you can enjoy a bath under the rain shower. 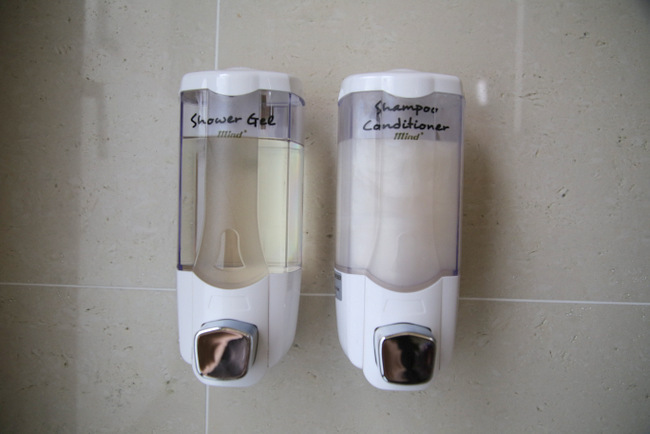 What’s provided are refreshing citrus-scented body wash and two-in-one shampoo and conditioner from a dispenser that leaves your skin moisturised after a shower. More importantly, the water pressure is strong. And the bath towels are kept in the bedroom wardrobe in case you can’t find them. Bring your own tooth brush and tooth paste or any of your daily necessities. Don’t forget your sunscreen or tanning oils, face wash or moisturisers. The wardrobes have electrical points as well as bath towels. Another thoughtful feature in the bathrooms are the motion sensors that lights up in the dark so you don’t have to leave the toilet lights on when you go to bed. There was a Queen sized bed in the master bed room and a single bed in the other bed room. All I can say is I had a very good sleep during the two nights here. 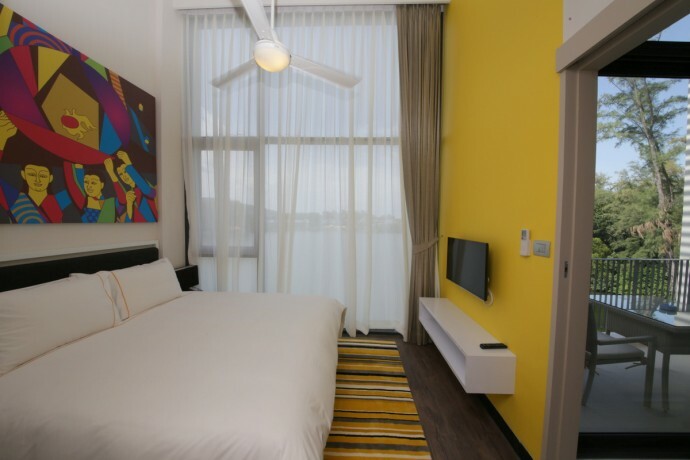 The yellow wall, brightly coloured painting and carpet gives the room a very lively yet cosy feel. There are two pools here at Cassia Phuket. A sand pool for the kids and the infinity pool for the adults. Deck chairs around the pool area are perfect if you want to bask in the sun. The pool overlooks a lagoon as well as the Outrigger Laguna Phuket Beach Resort at the other end of the lagoon bank. 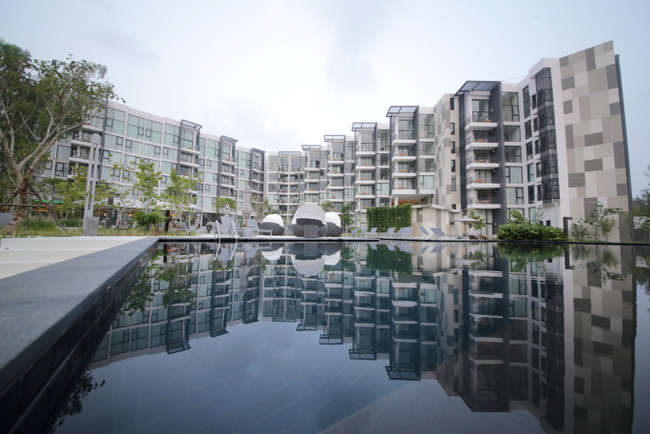 Doesn’t the Cassia Phuket look like a condominium? Nice when hotels make you feel like you are at home. Laguna Phuket Ferry Service – your ride to the other resorts and Bang Tao Beach. You can get to the private Bang Tao beach by the Laguna ferry service. 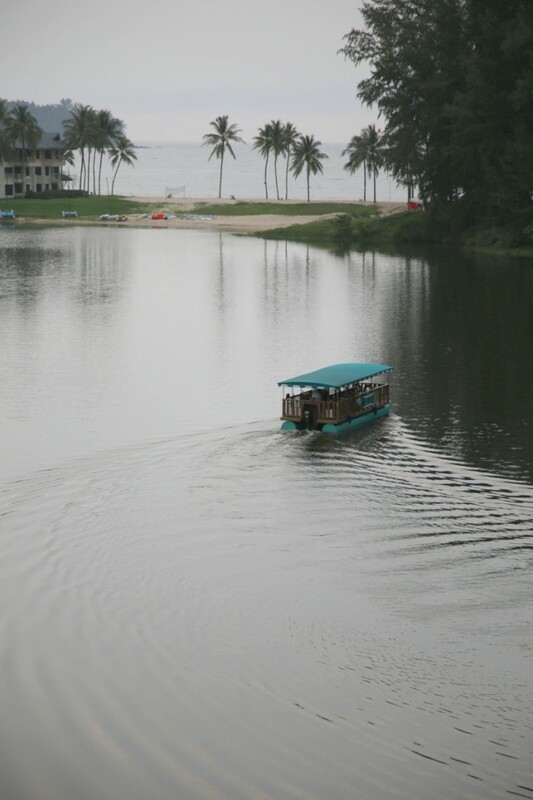 This same ferry service operates every 20 minutes and brings you to the other resorts in Laguna Phuket from 9am to 9pm daily. Chill Chill offers spa treatments as well as manicure and pedicure. Need some pampering, then head over to Chill Chill where you can get a sports or Thai body massage or a foot, head and shoulder, back or hand massage ranging from THB600 up to THB1,300. Facials, manicure and pedicures are also offered here starting from THB300. Waxing is also available here. The most expensive treatment at Chill Chill is the Full Legs waxing session which is priced at THB1,700. As part of the opening specials from now till 20 December 2015, guests get a 15% discount off the first treatment and 25% off for two treatments or more. 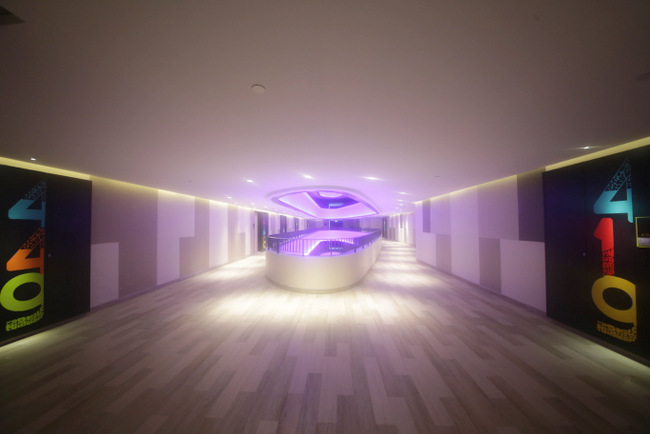 You just have to book your treatments in advance as slots are limited because Chill Chill only has a massage room, and a more open area for manicure and pedicures as well as foot massages. The 90 minutes sports massage helped to remove the knots from the frequent travels throughout this month. I regret not extending it for another hour just to pamper myself. 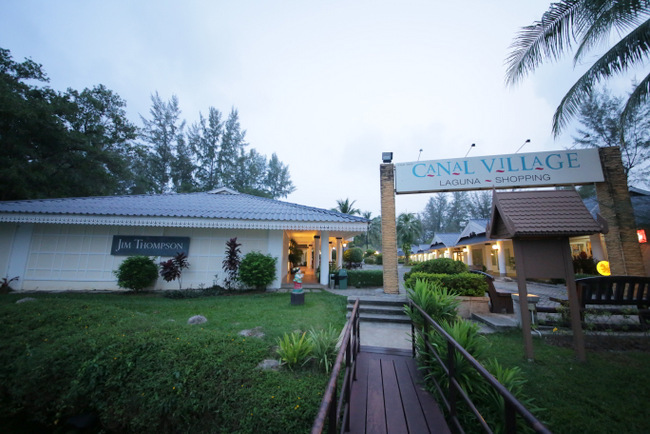 Canal Village is located within a short walking distance from Cassia Phuket. Walk over to Canal Village for some retail therapy. It is just two minutes by foot from Cassia Phuket. Get out of Cassia Phuket and turn left. You’ll see Canal Village across the road. Walk past the carpark and immediately see Laguna Laundry and an ATM and Money Changer. 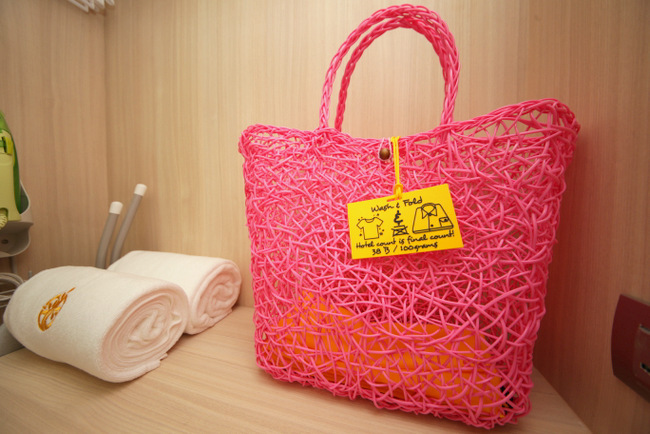 There are over 30 shops offering a variety of merchandise including a Jim Thompson boutique and separate Factory Outlet. There is also a 24-hour clinic and mini mart where you can get basic food stuff such as instant noodles, eggs, cookies as well as refreshments. The mini mart closes at 8pm every day. There are also some eateries including one that serves Illy’s coffee. Surprising enough, I didn’t get any mosquito bites during my stay at Cassia Phuket. I liked the privacy here without being disturbed by hotel staff when I was in my room. The non-intrusive service gives me the chance to get away and be in my own world. An outdoor balcony allowed me to just enjoy the cool fresh air at night. If you are travelling with family or friends as a group, Cassia Phuket may just be your next holiday accommodation. If you are the outdoor type, you can check out the Laguna Tours excursions and activities. 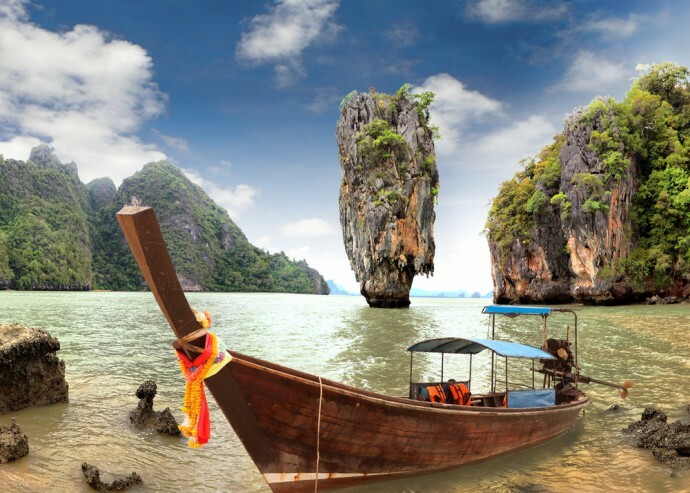 Take the popular Phang Nga Bay 4-in-1 Full Day option and visit a Sea Cave, James Bond Island and enjoy a Thai Seafood lunch at a Sea Gypsy Village for slightly under THB4,000. Other packages are also available. Laguna Tours information booth is located at Canal Village but book your packages a day in advance. Click on the photo below to view more images on our Flickr account. Cassia Phuket is located at Moo Tambon, Cherngtalay, Amphur, Thalang, Phuket 83110. It is located within the Laguna Phuket integrated resort complex and is 21 km south of Phuket Airport and faces the Andaman Sea.